OTTAWA — The Ottawa Senators won their first game at home this season, holding off a third-period rally by the Toronto Maple Leafs for a 6-3 win at Canadian Tire Centre on Saturday. Derick Brassard and Mark Stone each scored twice, and Nate Thompson and Ryan Dzingel scored for Ottawa (4-1-3). Erik Karlsson had three assists, giving him six in his past two games. Craig Anderson made 28 saves for the Senators, who are 1-1-3 at home. The loss ended a three-game winning streak for the Maple Leafs (6-2-0). James van Riemsdyk, Auston Matthews and William Nylander scored, and Frederik Andersen made 29 saves. The Maple Leafs trailed 3-0 entering the third period, but goals by van Riemsdyk at 6:00 and Matthews at 8:34 made it 3-2. Stone scored seven seconds later to make it 4-2. The Maple Leafs came back again when Nylander scored with a wrist shot from the right circle on the power play to make it 4-3 at 12:52. Brassard scored his second at 16:30 for a 5-3 lead, and Stone scored into an empty net at 18:21. Senators forward Bobby Ryan left the game in 1:24 into the third period after he broke his right index finger. Toronto coach Mike Babcock said the Maple Leafs learned why the Senators had success in the Stanley Cup Playoffs last season, when they lost to the Pittsburgh Penguins in the Eastern Conference Final. Matthews showed his speed when he worked a give-and-go with Nylander in the neutral zone. Matthews skated down the middle to score his seventh goal of the season. With the Maple Leafs pressing at 6:50 of the third period, Anderson got his left pad on a quick shot by Toronto forward Tyler Bozak. Stone showed his ability to steal the puck when he intercepted a pass by Maple Leafs defenseman Nikita Zaitsev at the Toronto blue line, broke in and scored on his rebound at 8:41 of the third period. 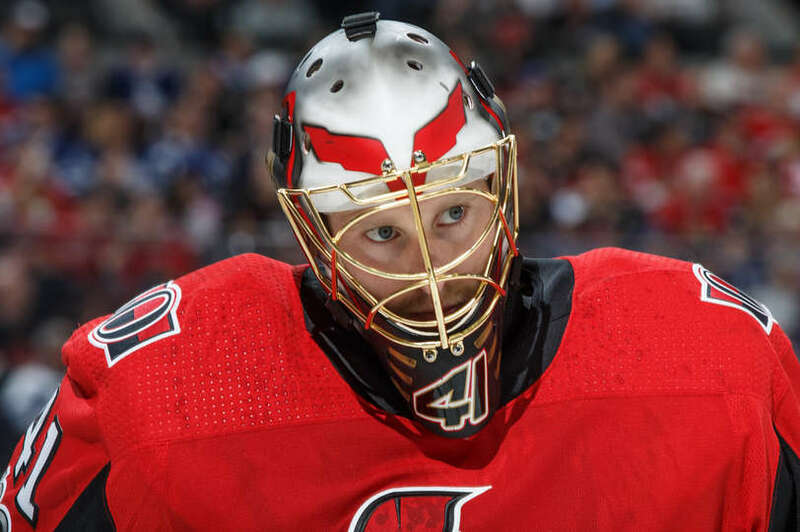 Ryan will be out a month, Boucher said. This is his third injury to the same finger in the past two seasons. His previous injury was sustained Feb. 18 against the Maple Leafs. … Anderson became the first goaltender to play 300 games for the Senators. … Ottawa rookie forward Logan Brown, the No. 11 pick in the 2016 NHL Draft, had his first NHL point, an assist on Thompson’s goal, playing his third game.